We are very happy to welcome a litter of 7 adorable puppies from multiple VA IPO3 KKL Tito vom Finkenschlag and V IPO1 KKL Wendi di Casa Pileci. 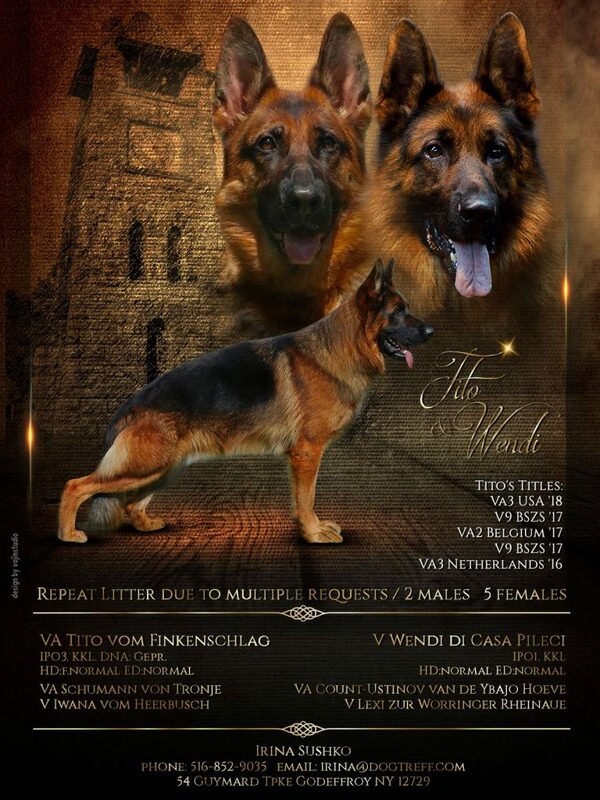 Both parents are German import pink papered German Shepherd dogs, hips and elbows certified. Tito is magnificent confident male with very masculine noble expression and solid temperament. Tito presents dry and firm body with very powerful movement. Progeny always have excellent confirmation, strong bitework and deep red pigmentation. Wendy is a very expressive female with deep red and black coloring. She is the daughter of worlds VA10 Count Ustinov. Very solid nerves, good drive and obedience. Wendy is extremely affectionate dog, love to give hugs and kisses and a super caring mother for her pups. Seven little trouble makers are all large and substantial with gorgeous colorings and strong heads. These puppies will have deep red color, pronounced structure and fantastic movement. They will have stable temperaments, excellent working abilities, loving dispositions and will make exceptional family companions and protectors. The puppies will be exceptional for show ring, suitable for IPO and performance homes such as agility, competitive obedience, tracking etc. as well as active family companions.